Cacique 500 Extra Anejo Rum is worth discovering … smooth and creamy, delicately balanced, and drinking more like a fine Cognac. Cacique is a Spanish version of a word that comes from out of the ancient Caribbean Taino language. It means Chief of the tribe, and Cacique is certainly the leader of Venezuelan Rums. It is produced by Destilerias Unidos, who make Pampero and Diplomatico Rums as well. Destilerias Unidos is, in turn, owned by Diageo, who won everything, but that is a different story. Cacique started in 1959 an is now considered the best premium dark Rum from the region. They make a range of Rum products, including a Gold, Anejo, 500 Extra Anejo, and Antiguo. Cacique 500 was added to the product line in 1992. If you think about that for a minute, 1992 minus 500 equals … right. In fourteen hundred and ninety two Columbus sailed the ocean blue. And Cacique 500 was launched to commemorate the 500th anniversary of that journey. But the resulting special edition Rum turned out to be wildly popular, so they officially added it to the line up. Cacique is a premium Rum brand, so after distillation in Copper stills, all of their Rums are aged at least two years. 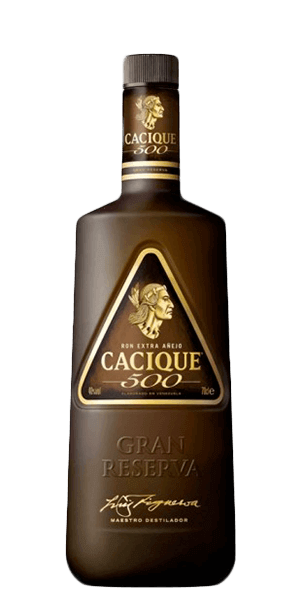 Cacique 500 is an “Extra Anajo,” which means that this one is aged for about eight years in American white oak barrels. This is really good stuff … smooth and creamy, dark and delicately balanced … drinking more like a fine Cognac than a Rum. So discover a bottle of Cacique 500 for yourself and party like it’s 1492. What does Ron Cacique 500 Extra Anejo taste like? The Flavor Spiral™ shows the most common flavors that you'll taste in Ron Cacique 500 Extra Anejo and gives you a chance to have a taste of it before actually tasting it.